The Day After A Health Care Crescendo, Each Side Plays A Familiar Refrain : Shots - Health News Supporters of the Affordable Care Act are back to singing its praises and doling out money. Opponents are trying to focus on the one aspect of the case that they won, limiting government's ability to withhold Medicaid money from states. 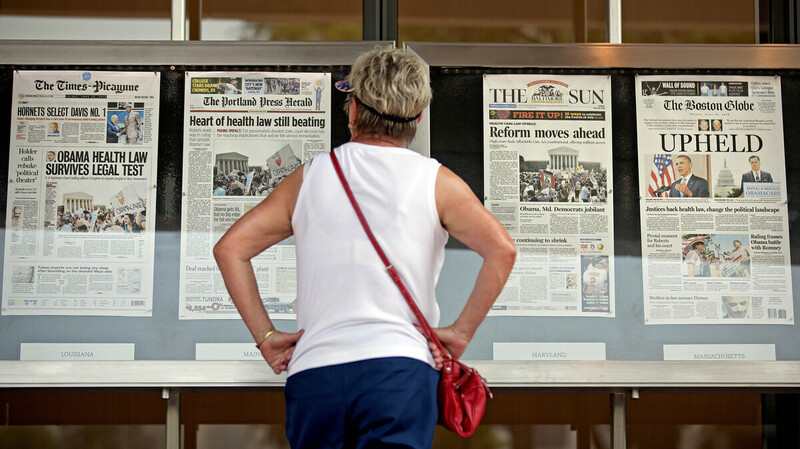 Joy Reynolds of San Diego, Calif., looks over Friday's front pages on display at the Newseum in Washington, the day after the Supreme Court ruling on President Barack Obama's health care law. "Implementation will proceed, but the pace will vary," predicted Gregg Bloche, a professor of law and public health. "Tea Party-dominated states will slow-walk, or stage their version of a sit-down strike, over creation of insurance exchanges and many other features, including Medicaid expansion." That's because the one thing the court's decision did change was to make the health law's huge Medicaid expansion optional for the states, rather than mandatory. A few blocks away, at the conservative Heritage Foundation, Texas Attorney General Greg Abbott, one of the plaintiffs who sued over the Medicaid expansion, made kind of a startling confession. He said the 26 states that sued over Medicaid never expected to prevail. They claimed that the federal government was being too heavy-handed in forcing the states to add 17 million more people to Medicaid's rolls. "We thought we didn't have a chance to win this case. We inserted it in part to ensure that we had standing," he said, meaning the states needed to be sure they could remain part of the overall lawsuit against the mandate. "We thought multiple times about abandoning the claim altogether because of the magnitude of the legal challenge. Policywise, we knew we had to challenge the Medicaid expansion mandate. Legally, we thought it was a loser all along." Today's turned out to be new money available to states to help them plan their health exchanges. Those are the online marketplaces where individuals and small firms will be able to shop for coverage. "The federal government and our state partners are moving forward to implement the health care law," Health and Human Services Secretary Kathleen Sebelius said in a statement. "This new funding opportunity will give states the resources they need to establish affordable insurance exchanges and ensure Americans are no longer on their own when shopping for insurance." And it turns out the legal challenges to the law aren't, in fact, over. Part of the law that requires most insurance plans to provide prescription contraceptives takes effect in just a few weeks. Nearly two dozen lawsuits have been filed charging that the requirement violates religious freedom. Jennifer Marshall, head of domestic policy studies for the Heritage Foundation, says that while the law gives religious employers like hospitals or universities an additional year to come into compliance with the rules, that doesn't apply to businesses that are simply owned by someone who has a moral objection to offering the coverage. "Because of that, several such family businesses have filed suit, and the Alliance Defense Fund has asked for a preliminary injunction in one of those suits by Aug. 1, so that family business does not have to begin planning for a health plan that will violate its conscience," Marshall said. But those with religious objections to contraception aren't the only ones worried about how the law will be implemented. The health insurance industry is still unhappy with the way the insurance mandate is crafted. Mark Bertolini, who heads insurance giant Aetna, says he's worried that young healthy people won't sign up for insurance until they need it. "Think of it this way," Bertolini said, "if everybody could buy homeowner's insurance as the loss was about to occur or as it was occurring, our homeowner insurance would be very expensive." The industry is hoping that either the penalty for not getting insurance will be made larger or some other way can be found to ensure that people eligible for coverage actually sign up.